And so it begins. Stock will fall. Chris K will exit (with a multimillion $ golden parachute),and Operators will get the blame.Modern and Progressive. With the above opinion, and with Andy McKenna bailing out, Im selling my shares NOW. I don't know about the share price. 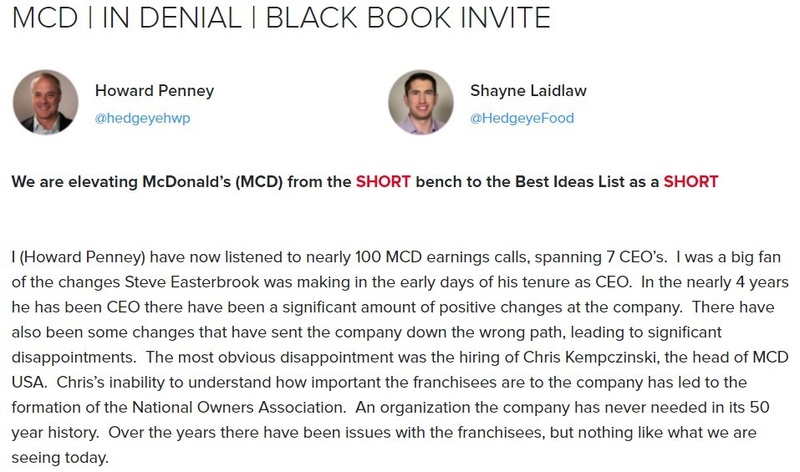 It's my personal belief that MCD will go to a REIT structure and unlock the value of all it's real estate at fair market value... McDonald's will no longer be McDonald's as we know it. we will be in the next Jim collins book "good to gone." like circuit city, etc. McKenna has been around a very long time and is getting up in age. Selling his stock may be due to estate planning, family or health issues. I don't think that it follows that he is worried that the stock is about to lose a lot of value. 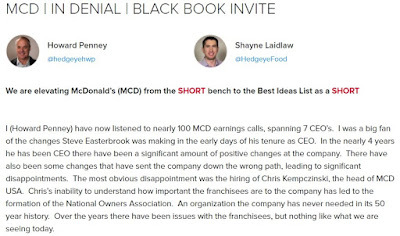 My concern in all this is that Easterbrook is staying in the shadows and not providing full disclosure to the operators about automation, its cost, its timing and the obvious discontent of the operators. The operators credit worthiness is a huge asset for the company. To ignore us only leads to speculation, fear and distrust which cannot be good for him. He cannot implement his plans if the operators won't sign the notes with the banks to do it. He knows this but refuses to address it. I Agree with the above post. Unfortunately, these costs are coming in WAY HIGHER than what was presented at the gallery walk. And the return is WAY BELOW what was presented at the gallery walk. This will be the McDonald's version of the "Ford Edsel"
What a waste of money on all sides.... Apparently marketing was the only waste of money (our "efficiency problem)... NOT TRUE. This entire system would have done better to buyout an existing company, pay down debt, or invest in the S&P500 or just set it on fire. ROI is a unicorn or the Loch Ness Monster -- we've heard about it, but have yet to see it. McDonald's uses OROYI, not ROI. "Our Return On Your Investment"! I looked at the company's financials and saw the Accounts Receivables have increased from $1.9bn to $2.4bn due to EOTF contributions... corporate said "they're not focused on collections"... is anyone just not paying them back?